US News and World Report published its rankings of full-time MBA programs today, and Stern dropped from 11 last year to 20 this year, we know why, and here’s why you shouldn’t accept it at face value. US News shared the rankings with us last week. We were surprised, looked at the data, and found that Stern’s scores were higher than a number of other schools with higher ranks (see here for example.) So we challenged their ranking of Stern. We promptly provided the correct information, but US News declined to adjust the rankings. The failure to submit the data is ours; that said, it was wholly unintentional, it’s a question we’ve always answered in the past, US News never flagged the missing information, and the missing data was virtually identical to last year’s. Going forward, we will further tighten the procedures for data submissions so such lapses do not recur. I thought it important to write you because it is not right to let this ranking stand without comment given that we know it is based on faulty information that we sought to correct before US News released its rankings publicly. In addition, for both prospective students and current members of our community, I would ask you to bear in mind: in the real world Stern’s outstanding quality is no different this week than it was last week. US News and World Report published its rankings of full-time MBA programs today. In the rankings as published, Stern dropped from 11 last year to 20 this year, a surprise given the stability of Stern's performance over the years on the eight criteria used to determine the rankings (see Table 1 below). Inquiries to US News during last week’s embargo period, when we had the opportunity to preview the rankings in advance of their publication, revealed that much of the decline in Stern's ranking was attributable to a single missing background data point in our survey submission, which included requests for more than 300 data points. That background data point pertained to the number of entering students who submitted the GMAT. The data point has been provided by Stern in previous years, and its omission was wholly unintentional; its value was nearly identical to that we submitted last year. In lieu of the missing data point, US News informed us that they used an "estimated" number, though we have not been told what this estimate was, on what it was based, or how it was factored into the computation. Nor did US News flag the missing data point in the final step of their data verification process, and unfortunately, Stern’s internal reviews did not pick up the omission, either. Stern takes full responsibility for this oversight. 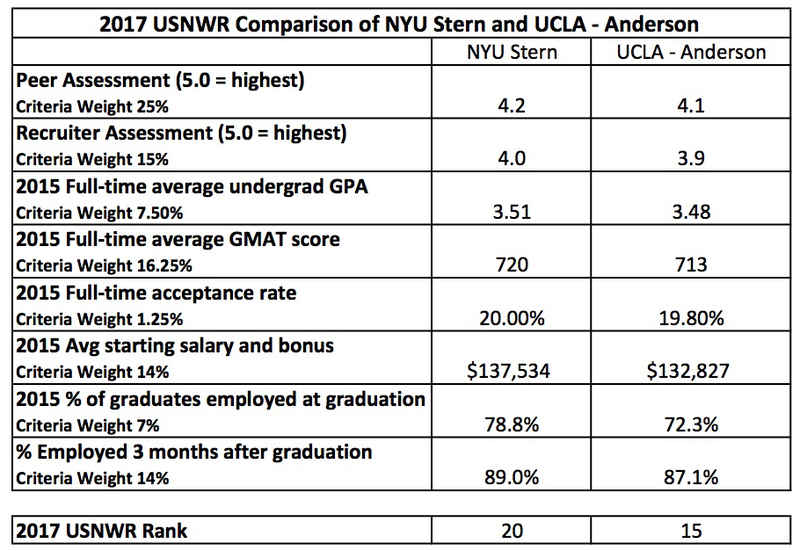 Once Stern learned of the omission, we forwarded the missing data point to US News and requested them to re-run their computations so that the rankings could better reflect reality. US News declined this request, even though we believe the ranking as published is anomalous and inconsistent with the reported inputs on the eight criteria. Going forward, as we strive to improve the School's actual performance on every front, we will also further tighten significantly the procedure for data submission so such lapses do not occur in the future. Finally, let us remember that while rankings matter because they are an important reference for prospective students, the reality of Stern’s quality is no different this week than it was last week.